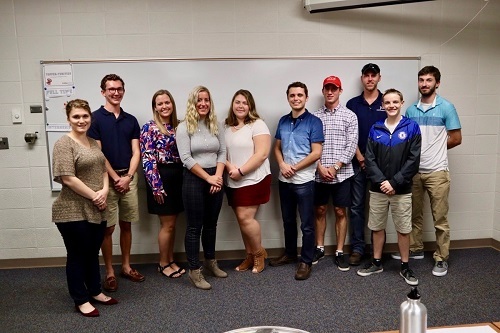 The Center for Entrepreneurship & Innovation housed in WKU's Gordon Ford College of Business awarded four student teams $525 in the annual Topper Tank Elevator Pitch Competition, held Tuesday, October 2, 2018. The Topper Tank Elevator Pitch Competition is similar to the ABC show “Shark Tank.” This year, 10 student teams presented their great ideas and inventions in 90-second elevator pitches to four judges. Student participated in two tracks: face-to-face with live judges or a YouTube video. There were three face-to-face winning student teams and one YouTube winner. 1st Place ($250): Lauren Hayden for Augusta Media Co.
Senior Broadcasting Major Lauren Hayden from Bowling Green, was nervous to pitch her idea but the judges and competition welcomed her idea with open ears. “Topper Tank is truly a great experience for our students to pitch an idea they have to judges, get feedback, and potentially then move on to the business plan competition. Our students have some really solid ideas, and getting to showcase them in front of the judges is wonderful practice,” said Dr. Whitney Peake, Director of the Center for Entrepreneurship and Innovation. Judges for the Fall 2018 competition were: Dr. Paula Potter, Chair of GFCB's Management Department; Dr. Ray Blankenship, Chair of GFCB’s Information Systems Department; Ms. Samantha McCormick, GFCB alumna and founder/owner of Taboo Dance and Fitness; and Mr. Nathan Cherry, WKU alumnus, realtor at Caldwell Banker Legacy Realtor Estate Group and property manager at Progressive Property Management Group. Ms. McCormick, former winner of the Topper Tank Pitch Competition, provided advice to this year's participants. “If you dream it, you can achieve. I dreamt of Taboo and with participating in Topper Tank, the Business Plan Competition, and going to state competitions, I used the Center as a launch pad to achieve my dream,” she said.